Waist N/A 27" 28.5" 29.5" 31.5"
Length N/A 30.5" 31" 31.5" 31.5"
This adorable women’s mini dress comes in your choice of black or white bodice with a black skirt. 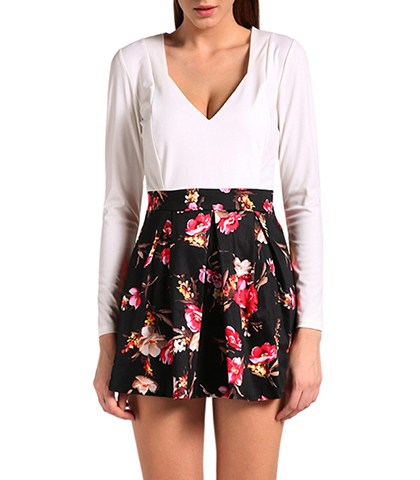 A floral pattern adorns the skirt portion, while the top remains solid. It features a low vee neckline and long sleeves. The waist is clearly defined by a high, well-fitted band. The skirt flows from the waist band into a moderately full mini skirt. The length of the skirt reaches the upper thigh portion of the dress. The bodice is fitted and has a plunging, modified, vee neckline. This dress is washable in warm water and may be tumbled dry. It is available for purchase in sizes Extra Small, Small, Medium and Large.